BEVERLY – The girl groups that dominated the early days of rock ’n roll — Martha and the Vandellas, The Ronettes, The Shirelles — all had one constant: a strong lead singer. Theoretically, all members of the group were equal — it’s just that lead singers were more equal than others. And as the lead singer went, usually that’s the way the group went. And so as tangled relationships and rivalries evolve, the one-for-all, all-for-one vibe of three young girlfriends who become the chart-topping trio The Dreams slowly unravels in the 1981 Michael Bennett musical “Dreamgirls,” now at the North Shore Music Theatre through June 19. Bill Hanney marks the beginning of his sixth season at the NSMT helm and the theater begins its 60th season with the Tony Award-winning musical that is a not-so-thinly-disguised retelling of the story of the 60s super girl-group The Supremes, and the relationship between manager Berry Gordy Jr. and lead singer Diana Ross. 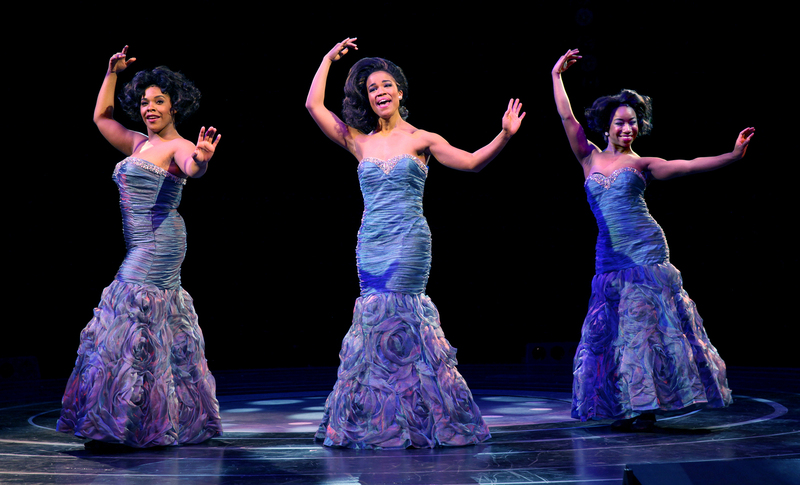 In “Dreamgirls,” three young girls — the full-voiced Effie Melodey White (Bryhoma Marie Parham), the beautiful Deena Jones (Britney Coleman) and young, naïve Larrell Robinson (Destinee Rea) and C.C. White (Noah J. Ricketts), Effie’s brother, have journeyed to the famed Apollo Theatre in Harlem to win a singing competition that will put them on the map. The fix is in against them, courtesy of Grasan Kingsberry as dashing, handsome, charismatic Curtis Taylor, Jr., the manager who tilts the scales to get the chance to manage the trio then called The Dreamettes. He sees their promise but first, says Curtis, they must prove themselves as back-ups for R&B superstar James “Thunder” Early (Eric LaJuan Summers), a character who is a compendium of several R&B stars of the era. Curtis’ guile and the writing of C.C. White soon have The Dreams climbing up the charts, but things get complicated when Curtis — despite he and Effie being a couple — replaces her as lead singer with Deena. Soon he replaces her with Deena in his heart, and Effie’s betrayal is complete when Curtis tells Effie — whose personal behavior has taken a downturn — she is out of the group, in favor of Michelle Morris (Breanna Bartley). C.C. then makes the wrenching decision to stay with Curtis and the group. The voice of Parham as Effie fills the theater and then some. She may be the first person to bring down the house with her rafter-rattling performance of “And I Am Telling You I’m Not Going” and then disappear below the house via the centerstage elevator. Don’t worry. She’ll return in the second act for the regretful “I Am Changing” before an electrifying cover of “One Night Only” as part of a dramatic comeback. Curtis doesn’t just have eyes on The Dreams. He sweettalks Early into dumping longtime manager Marty (JC Montgomery) and joining the crossover movement from R&B to pop that is getting acts like The Dreams into theater and cities that black acts never got into before. Eric LaJuan Summers plays it just right as Early, the character played by comic Eddie Murray in the movie. He has issues, especially as it pertains to women, but Summers finds the human being beneath the bluster and bravado and the vulnerability when Early realizes he is no longer a star, and suffers a meltdown as Lorell’s star eclipses his and his career takes a nosedive. 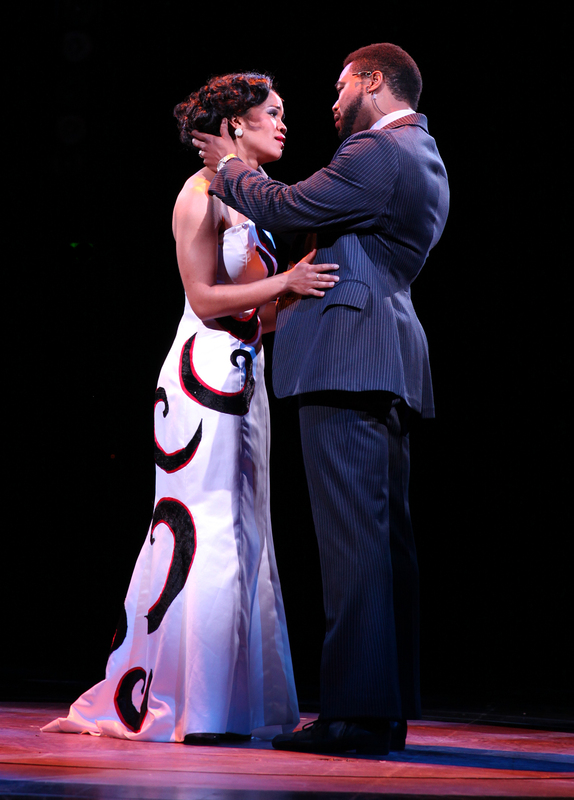 Tom Eyen’s book and lyrics effectively tell the story in dialogue and song, although “Dreamgirls” is largely sung through, and although Henry Krieger’s score is uneven, there are enough big numbers and hits smartly sung to carry the day, such as the title tune, and “When I First Saw You,” sung by Grassberry as Curtis. Evan Bartoletti’s scenic design makes effective use of the ramps, elevator and aisles in the theater to move the action quickly and effectively. Paula Peaseley-Ninestein’s costumes have to be spectacular, and they do carry the day in the many production numbers, although I did notice in one of the numbers near the finale one of The Dreams had a gown mismatched with the other two Dreams. Jesse Vargas’ orchestra brims with energy, bringing the score to full life. “Dreamgirls” follows the same formula that has helped bring NSMT back to full life and re-established it as one of the leading theaters in the region: a well-cast ensemble, able direction and choreography, and strong production values. The North Shore Music Theatre production of “Dreamgirls.” Book and lyrics by Ton Eyen, music by Henry Kreiger. Original production directed and choreographed by Michael Bennett. Directed and choreographed by Nick Kenkel. Scenic design by Evan Bartoletti. Resident costume designer Paula Peasely Ninestein. Lighting design by Kendall Smith. Sound design by Michael Eisenberg. At the North Shore Music Theatre through June 19. http://www.nsmt.org.